Anointing with oil is an ancient tradition that is older than Christianity and is continued throughout the globe today. Healing comes to us in many ways – the most obvious is physical when our bodies are struggling to regain health and wholeness or at least approximate our previous condition. Of course, healing can also come to us emotionally, spiritually or even relationally. There are many places in our lives where we can point to things being out of order. The Church has always had healing as a part of its ministry. The ministry of Jesus and then the Acts of the Apostles included healing of people in the community. This Sunday, we will offer a short healing service in the sanctuary at 12:15 pm. During this time, we will engage in a short liturgy and then follow it up with individuals coming for prayer at the front with the clergy (Sam and Don in this case). 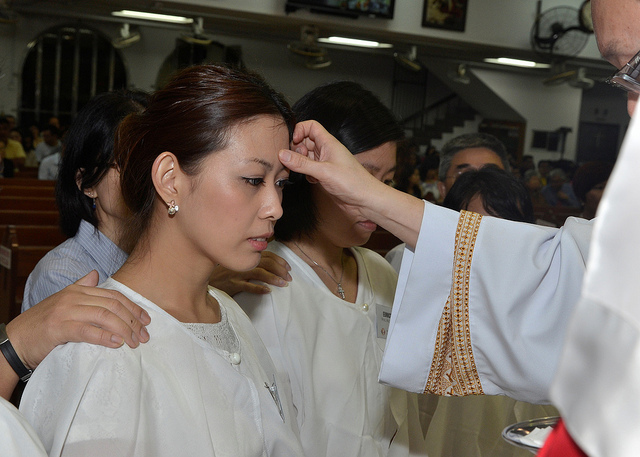 We will anoint your forehead with oil in the sign of the cross and pray for whatever is requested. The request and prayer will be between the individual and the clergy, rather than announced to the entire gathered body. As we recognize that this is still the Easter season, we know that resurrection comes to us in many forms with healing being a significant instance. We hope that this service will provide God’s peace and wholeness to all who participate! Photo by John Ragai via Flickr.com, used under the Creative Commons license.